Barlow Fold in Romiley sometime around the beginning of the last century. The clue is in the name - Fold. It means an enclosure from waste land or moor land, either for people or for animals. It still survives in the word ‘sheepfold’ but originally it had a much wider application. The enclosure of common land has been a continuing process for centuries in England, but at first it was an occasional movement though it did become more systematic under the Tudors and the Stuarts. The early enclosures were mainly in southern and eastern England, south of a line from the Severn to the Humber but by the eighteenth century the Enlightenment was suggesting new approaches to agriculture as well as other fields such as transport and industry. The final wave of land enclosures in England occurred between about 1750 and 1850 in the form of Parliamentary enclosures and these affected the north of England as well. The first enclosure movements in the Stockport area took place at the beginning of the eighteenth century at Heald Green but by the middle of the century the poorer eastern areas were being enclosed. Parliamentary inclosure acts were not just for existing agricultural land but also for the division and privatisation of common ‘wastes’ (in the original sense of uninhabited places.) In Romiley the western end of Werneth Low was enclosed by the 1750s and a farm and cottages was built at Greave to work the land. The same development occurred at Barlow Fold though on a somewhat smaller scale. It was recognised that these new dwellings could not prosper purely by working the land and they incorporated workshops for either weaving or hat-making. A similar development took place in Mellor in 1779 when the common land of Mellor Moor was enclosed. It is well worth a detour to visit Barlow Fold and Greave Fold. Two small settlements of eighteenth century cottages surrounded by much more recent housing. Of course, they have been gentrified, but it is not difficult to strip away some of the modern veneer and picture a small Pennine upland working community. Greave Fold is much bigger than Barlow Fold with 48 dwellings compared with 12 but both settlements have an arrangement of buildings which isolate the fold from its wider setting and creates a sense of enclosure. The buildings are small, only two storeys and built of local stone, handmade local brick and natural slate. The irregularity of the building line demonstrates the informal processes which led to the construction of each dwelling, and this in turn gives progressive views into and through the community. Barlow Fold has a typical fold layout with two short and irregular terraces of two storey houses facing each other on either side of a narrow lane. Cottages are set close to the roadway, opening off a minimal verge which is demarcated with a line of setts. As late as 1872 Barlow Fold was surrounded by open countryside and the Werneth Turnpike passed through the hamlet. The stone gate posts of the Barlow toll gate can still be seen at its southern entrance, giving the visitor a sense of arrival. The oldest house is Number 1, timber framed and dating from the 17th century but much rebuilt. Number 6 is mid 17th century, originally two cottages built of coursed and squared rubble, but only one room in depth. Number 12 is late 18th century but built of rendered brick with a graduated stone slate roof. It has a simple planked door housed within a robust moulded timber frame. Greave Fold demonstrates the same distinctive features - the small scale cottages, the irregular building line and the vernacular materials used. 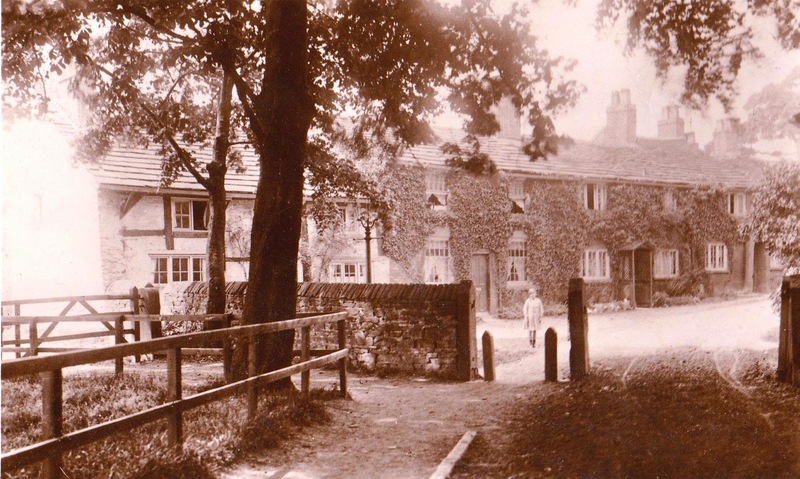 Most of the buildings were erected around 1750, possibly based on a farm site but the cottages near the church were built in the early nineteenth century, circa 1810. Many, if not most, of the cottages incorporated workshops or working space for various cottage industries, particularly textiles. It is now predominantly residential in character with community buildings in the form of the Forester’s Arms pub and the Methodist Chapel Sunday School. The settlement is roughly T-shaped arranged around a narrow lane which originally connected the farm with Werneth Road. The buildings shelter in the lee of the hillside with their backs to the prevailing wind. The quality of the townscape and its picturesque character owes much to its small scale and the informal groupings of structures, allied to a prominent yet varied roofscape. Drystone walls are important in creating continuity, linking building groups at the head and the foot of the fold. The former Holy Innocents Church, now a private dwelling, was built by the vicar in 1870 in memory of his two infant children. Single storey, it is built of machine-made brick and blue slate with a louvred belfry and a former entrance porch on the north gable. The Primitive Methodist Chapel of 1861, also converted to private use, is a much more substantial building. Built of local stone, it has regular coursing on the gable end facing the road whilst the side elevations use random rubble courses. Two storeys high, it shows round-headed windows with coloured glass on the road frontage, topped by an open belfry. There have been buildings on the site of the Forester’s Arms since at least 1777 but it is not known if it has been a public house for that time. It is two storeyed with a plinth and rendered walls topped by a stone flag roof. The contrast with some of the Edwardian villas leading into the fold can be particularly pleasing. Built of red machine-made bricks and roughcast render, they incorporate highly decorative detail in timber and glass and have an entirely different architectural character. Next time you are going through Romiley, take a small detour and visit the two Folds. Turn right off Compstall Road, up Birchvale Drive (or Carlton Avenue) as though you were going to Romiley Golf Club. Get out of your car and walk around - you won’t regret it.